In this revised edition of her first book, Dr. Clark examines virtually every area of home schooling. 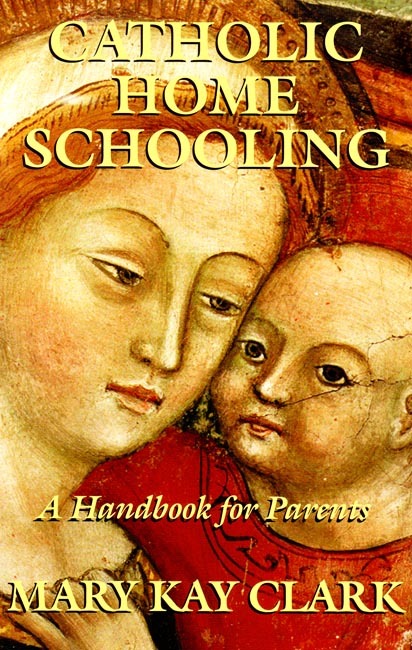 From How to Begin Home Schooling to The Socialization Issue, as well as many other topics including Home Schooling in the Large Family, Catholic Church Teachings on Marriage and Education, and The Future for Catholic Home Schooling, Dr. Clark takes the reader through the home schooling spectrum. Also included are Pope John Paul II's Letter to Families; Kenneth Clark on Responding to Authorities; Dr. Mark Lowery on The Father's Role in Home Schooling; Cathy Gould on Teaching Children Who Learn Differently; with Introduction by Father Robert J. Fox. This is a text which Catholic home schooling parents will refer to often, as it is over 360 pages of home schooling advice from one who has been engaged in Catholic education for over thirty years, has home schooled all of her seven sons, has spoken with thousands of home schooling parents, and now directs the largest Catholic home study school in the world! Copyright 1993, 2008. 5.5 x 8.5 inches. Soft cover. 362 pp. The price on this book is reduced to only $5.00 with the purchase of $50.00 or more of material through Seton Educational Media. 1 Why Catholic Home Schooling'? 2 What Is Catholic Home Schooling? Reviewer: Australian homeschool mother of 15 years. Dr Mary Kay Clark intelligently reveals how AUTHENTIC catholicism is the only form of proper education. She clearly points out with wonderful quotes from encyclicals and writings of the saints that this is to be found in a practising sacramental Catholic home. I am in my 15th year of homeschooling. I have six sons and 2 daughters. In my 3rd year I was priviledged to read this book. The very cover of the miraculous fresco of Our Lady Of Genzanno- Mother of Good Counsel won me over before I read a word. Not long after buying the book the same picture on the cover was replicated by yours truly and copied by my eldest son when he was 12. This same precious son at 25 years of age passed to Jesus' Mercy and love on her Feast day..his altar in our home has the same picture he drew above St Joseph and baby Jesus' statue. Mother of Good Counsel is real and always present with us right till the end, she is the Patron of homeschoolers. My comfort that she was there for him through all his life and even on the day he was called to God made his passing quite beautiful and extraordinary. I cannot stress the goodness and grace that pours from the cover alone. I guarantee that once you read the first page, you will HAVE to read it all and then re-read it for any future reference. This book is just so beautiful. Thank you and God bless you and all your beautiful family and friends Dr Clark. I recommend it to all- particularly holy priests. Mother of Good Counsel, pray for us. This book gives you the tools and the confidence to take charge of your own childs schooling into your own hands, and away from all bad influnces. I sure do love Mark Kay Clark's book Catholic Home Schooling! Every chapter I think "Yes, exactly!" This is phenomenal. I have a couple of years before my daughter is ready for school but I like to research everything and feel as prepared as I can be. We are definitely going to be a Seton family! This book is just that much more encouraging and empowering and keeps supporting or reassuring me that Homeschooling is the right decision for my family! Thank you!